Interested in new methods for improving the speed, cost and success of protein structure determination? Want to learn more about how to use structural and biophysical methods to functionally characterize macromolecules? 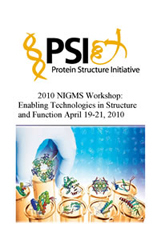 Then consider attending our 10th annual Enabling Technologies in Structure and Function workshop from April 19-21, 2010, on the NIH campus in Bethesda, MD. There’s no registration fee. As in years past, the 2010 workshop will cover all the practical issues concerning protein structure determination and biophysical methods. Presentations will focus on topics such as protein structure and function, hybrid methods, bioinformatics and homology modeling, and crystallization methods for soluble proteins and membrane proteins. In addition, we’re offering two hands-on workshops on methods for solving difficult crystallization problems and tools for mining the rich structure and function databases for biological macromolecules. There will also be a poster session. We build the oral sessions from attendees’ submitted poster abstracts, so we will continue to finalize the agenda in the coming weeks. The program is very student-friendly, and we welcome scientists involved in structural efforts abroad. Please feel free to forward this note to anyone who may like to attend. One of my activities as NIGMS director is meeting with members of the scientific community, including leadership groups from scientific societies. These conversations offer a valuable forum for sharing ideas and perspectives, and I find them informative and interesting. A few weeks ago, for example, I met with the board of the Society for Advancement of Chicanos and Native Americans in Science (SACNAS). The group of more than 30 people who visited me in Bethesda ranged from graduate students to senior scientists. We had a spirited dialogue about training and career development, including issues related to the diversity of the scientific workforce, and methods for fostering communication between NIH and the scientific community. I briefly discussed our preparations for a strategic plan on training and career development, which I announced at our recent advisory council meeting. I’ll do a Feedback Loop post in early March with more details on the strategic planning process, including a request for input. NIGMS staff and I welcome the opportunity to meet with groups and individuals who would like to know more about the Institute’s activities and plans. To arrange a meeting, feel free to e-mail me at bergj@nigms.nih.gov or NIGMS communications director Ann Dieffenbach at dieffena@nigms.nih.gov. On February 1, the President released his budget request for Fiscal Year 2011. The proposed budget for NIH calls for an increase of 3.2% over the Fiscal Year 2010 enacted levels (not including funds associated with the Recovery Act). The proposed budget for NIGMS represents a 3.6% increase over Fiscal Year 2010. A major contributor to the larger increase for NIGMS compared with NIH overall is that the budget calls for a 6% increase in stipends associated with Ruth L. Kirschstein National Research Service Awards. NIGMS supports substantially more training positions than the average across NIH. The release of the President’s budget request is the first step in the appropriations process, which includes Congressional hearings and culminates with the passage and signing of a bill that appropriates funds for NIH. We recently posted our Financial Management Plan for Fiscal Year 2010. Among the plan’s key elements are increasing the average size of a competing research project grant by approximately 2%, reducing noncompeting awards by 1% and increasing stipends on National Research Service Awards by 1%. As I noted in a previous post, NIH recently launched the Basic Behavioral and Social Science Opportunity Network (OppNet) and issued four funding opportunity announcements for the current fiscal year. OppNet is now planning initiatives for future years. Key to this effort is obtaining input from all interested parties about current and emerging opportunities in basic behavioral and social sciences research that offer the greatest potential for improving health and well-being. Toward this end, OppNet has just released a request for information soliciting suggestions for both short-term (1-2 years) and long-term (3-5 years) activities, which can focus on humans or animal models.